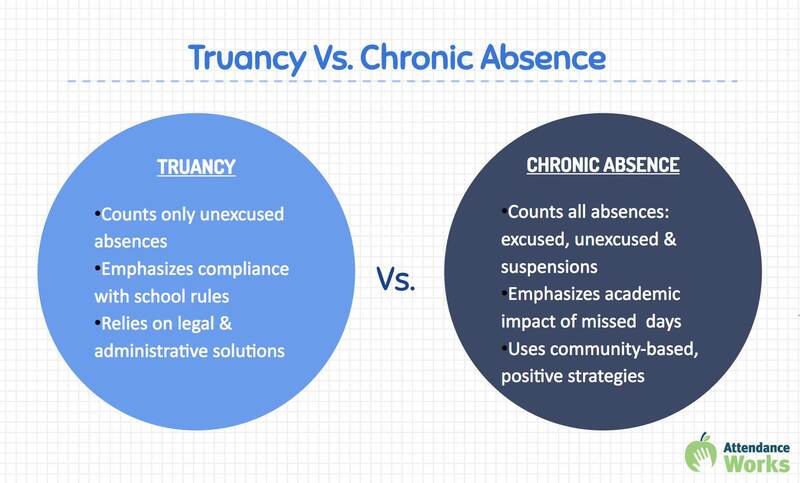 What’s the Difference Between Chronic Absence and Truancy? As the concept of chronic absenteeism gains traction across the country, some people are under the mistaken impression that it's just a politically correct way of saying truancy. Educators, policymakers and journalists often use the words interchangeably, describing the same, old problem with the same, old solution. In fact, the two terms describe different aspects of our absenteeism problem and require different approaches to bringing students back to school every day. First, let’s take truancy, a term that generally refers to unexcused absences. In the past, federal law required states to track truancy but left it to states to come up with the definition. California schools have tracked the number of students who are truant which is defined as missing three days without a valid excuse or are late three times to class by 30 minutes. In contrast, in Maryland, schools have monitored habitual truancy, defined as missing 20% of the school year (which is 38 days in a 180 day school year). With its focus on unexcused absences, truancy naturally leads to a focus on compliance with the rules. Students are missing school without an excuse, skipping school and violating mandatory attendance requirements. Fixing the problem becomes a question of ensuring compliance, often left to front-office administrators, and in the most severe cases, to the legal system. Policymakers often recommend punitive consequences for truancy – such as suspensions, jail time and fines – for children and parents. Some communities and courts have devised effective approaches to reducing truancy, but in other places, punitive efforts are pushing students out of school. Chronic absenteeism, on the other hand, incorporates all absences: excused, unexcused and suspensions. The focus is on the academic consequences of this lost instructional time and on preventing absences before students miss so much school that they fall behind. It recognizes that students miss school for many understandable issues such as asthma or homelessness or unreliable transportation, for which a punitive response is not appropriate. But what helps is working with families to share the importance of attendance and to fix the underlying problems that lead to absenteeism. Given this broader focus, addressing chronic absenteeism becomes an issue for the entire community. Medical providers can help address health challenges; transit and housing agencies can resolve other barriers to attendance; volunteers from businesses and faith communities can mentor students and support families. These approaches can also reduce truancy. Like truancy, chronic absence has no common definition, though many researchers and schools monitor how many students are missing 10 percent or more of the school year. That’s about two days a month, or 18 days in most school districts. The U.S. Education Department’s Office of Civil Rights this spring will release data showing how many students miss 15 or more days. This data represents the first time that many schools and districts will know how many students are missing so much school that they are falling behind academically. What’s the right response to this new information? Rather than launching a punitive crackdown, educators and community partners should use the opportunity to dig deep into their numbers to determine who is missing too much school and why. Taking a data informed, non-punitive approach that draws upon insights from students, families, teachers and community partners is what leads to strategies that can improve attendance and achievement. Click here to download a PDF of this blog and graphic.